The global sterile injectable drugs market has been envisioned by Transparency Market Research (TMR) to hold a significantly concentrated nature for its vendor landscape. In a new report by TMR, some of the important players of the market have been profiled by the analysts, including AstraZeneca, GlaxoSmithKline plc, Pfizer Inc., Sanofi, and Baxter International Inc. The authors of the report have elaborately profiled the players in order to provide a sound understanding of how the competitive landscape could shape in the near future. Readers have been anticipated to become familiar with future competitive scenarios and prepare beforehand for any prospective changes. 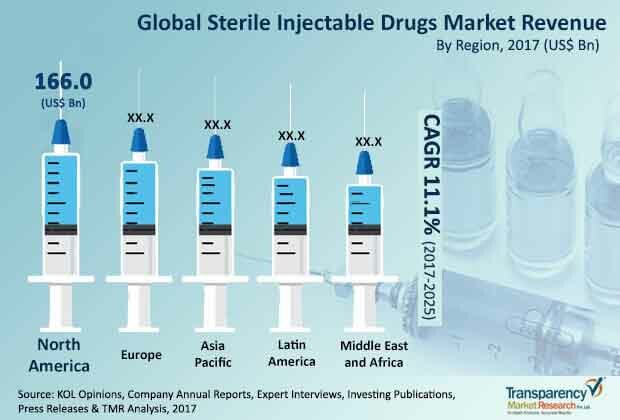 The global sterile injectable drugs market has been predicted in the TMR report to earn an estimated US$901.3 bn by the end of 2025 at a CAGR of 11.1% for the forecast tenure 2017-2025. In 2017, the market earned a US$387.1 bn. In terms of a segmentation by type, the large molecule market had earned a colossal share of 54.6% in 2016. By region, North America had secured a commanding position in the global market with a 43.0% share in 2016. The world sterile injectable drugs market has been expected to gain impetus due to the increasing preference for large molecule drugs over traditional ones. Cases of chronic disease which often require an immediate response include treatments using large molecule drugs, particularly in heart congestion and cancer cases. Nevertheless, small molecule drugs have also been projected to support the growth of the market, if not in like manner as large molecule drugs. These days, small molecule drugs have been adopted in oncology. Furthermore, their less cost and easy manufacturing could raise their preference in the coming years. Developed countries such as the U.K., Germany, and the U.S. witnessing an aggressive development of healthcare accessibilities and a rising count of diseases have been forecast to help monoclonal antibodies to register a faster growth in the foreseeable future. The international sterile injectable drugs market has been envisaged to be hindered by a loss in demand owing to high operational expenses and initial investments. Moreover, the complex manufacturing process of sterile injectable drugs could dampen market growth during the course of the forecast tenure. As a result, only a handful of new players have been able to enter the market. There could be a shortage in the supply of sterile injectable drugs due to a high degree of care and quality required to be ensured at different stages, viz. distribution, storage, packaging, and manufacturing. This could be due to the highly infectious and toxic nature of the drugs and rise of stringent government regulations. Howbeit, rising healthcare awareness pertaining to the management and treatment of chronic diseases, extensive research and development, and technological advancement have been prognosticated to be some of the crucial factors helping market growth to make a strong comeback. The international sterile injectable drugs market could be positively impacted by the advent of biotechnological products derived from human or other biologic sources.